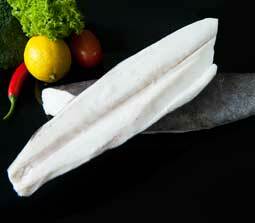 Oilfish is a highly fatty and soft fish with a rich and strong flavor. This white fish is best enjoyed grilled. *This fish is not recommended to be consumed as large portions due to it’s laxative effect. -	Our frozen natural Oilfish is frozen immediately upon catch on the vessel. Once at our factory it is never defrosted but instead processed to steaks, loins or others whilst in it’s frozen state.